Carnelian, Malachite, Mother of Pearl , Jasper. This piece is inlaid with different types of semiprecious stones are Carnelian, Malachite, Mother of Pearl , Jasper. This is perfectly handmade by the skilled artisan. A Finest Creation of art. You will love this piece at your home. We will ship it to you by DHL or FedEx in 2 to 3 weeks time. Note- Colours of semiprecious stones and marble may vary from the images shown. 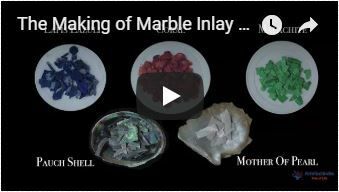 Marble inlay is a traditional art and only a few expert are skilled enough to do justice to it in this day and age. The delicate process involves carefully cutting and engraving marble shapes by hand. To begin with, a predefined pattern, like say, a floral or geometrical design is engraved on the surface of the marble. After this, small pieces of semiprecious stones of different shades are cut delicately to precisely fit and slipped into these grooves. You will be very happy to have these products in your home.